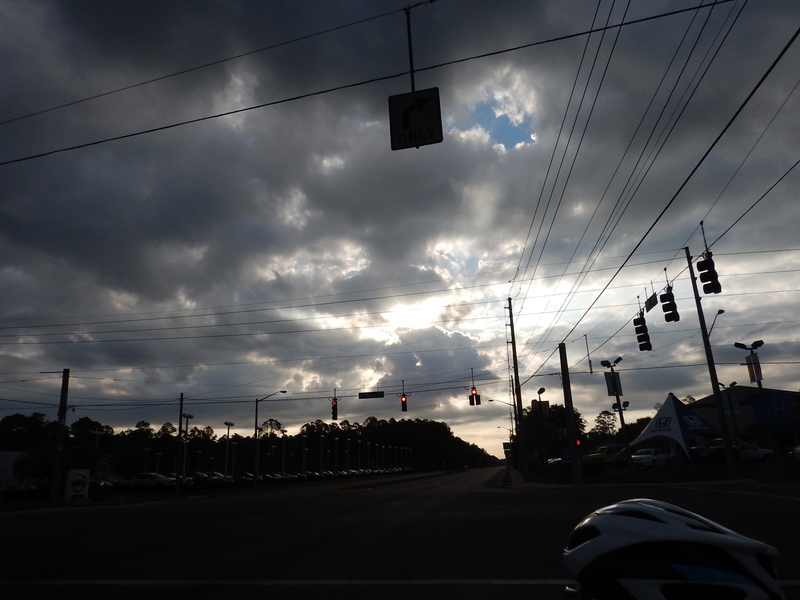 The day dawned with cloud cover. It turns out that there were some showers during the night which will have no impact on our day. Total miles to date: 2890…about 35 left! Our ride on the Hawthorne trail comes with a surprise. Local tandem riders Ally and Andrew are waiting for us when we reach the trail. Their plan is to ride with us until we exit the trail. This really is gator country. 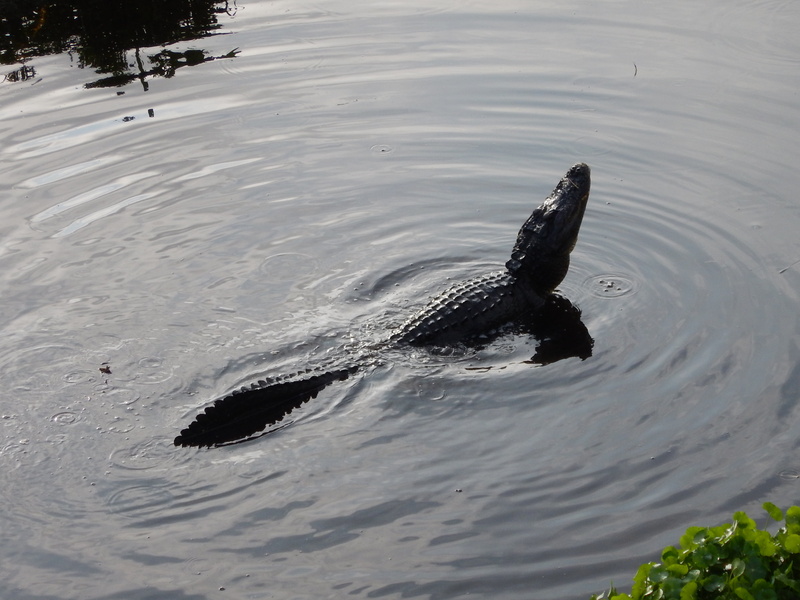 We take a short hike off the trail and see Paynes Prairie which is home to lots of gators. 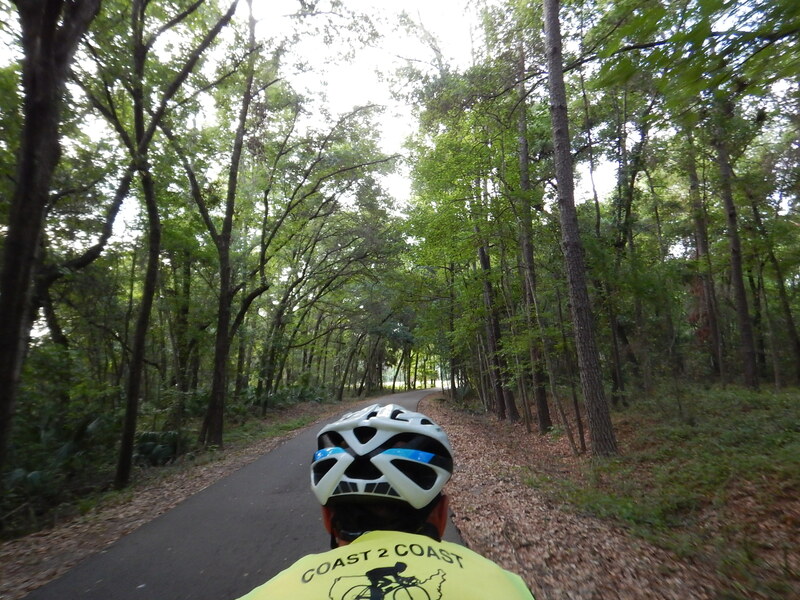 This is a meticulously maintained state park and trail and presents many photo ops. We share a rest stop with professional chocolate milk (and shake) drinkers Mary and Andrew. We decide we might as well join in the tradition before time runs out! Why yes there are, and I almost cause a stampede when I get off the bike for an up close picture. 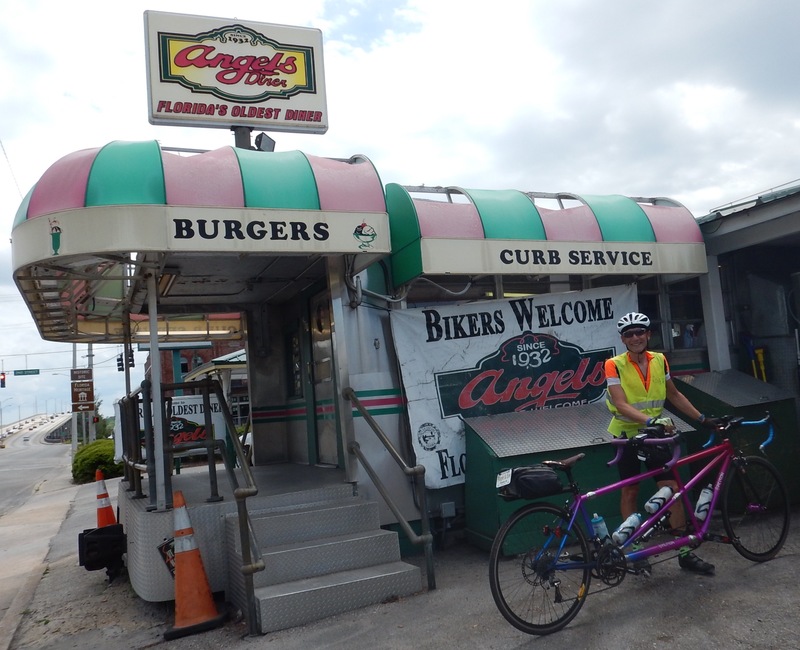 We lunch at the oldest diner in the state of Florida, which might also boast the slowest service. Good thing “bikers” are welcome. Luckily we are in no hurry. The ride is done and our hotel rooms are not ready yet. The last DQ visit of the trip is a bit disappointing because the building is so old it doesn’t have an indoors area to eat. We take ours down to the St. John’s River and pull up some shade. Free wi-fi in the room will make our uploading easy tonight, so you get lots of pics today! The last hill of the tour is behind us in this photo. 51 rides down and one to go! 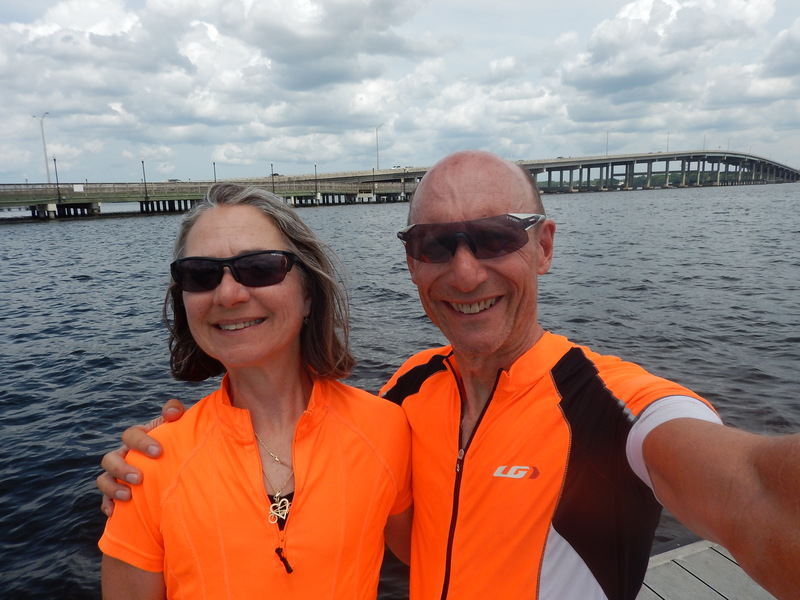 We trained and shopped for over a year, and here we sit in Palatka, Florida just 35 miles from accomplishing our goal. Thanks so much for all of the congratulations that are pouring in. We’ve loved doing the blog and getting your feedback. Many of you have been asking how we feel – it’s an exciting and emotional time. We’ve been in the saddle for about 200 hours. The journey HAS been epic, it’s been fun, yet grueling, and we are both physically drained. Tomorrow: our final day comes with lots of celebrations. Forgive us if we don’t have time to post. We promise to share the next day. So awesome! Thank you! Also, thank you for knowing how to correctly use the word “penultimate” in a phrase, and doing so. So much fun to read about your journey everyday!! I looked forward to it every day! I can’t believe it is almost over!! So glad I got to see you while you were in Texas too!!! What is next now????? We have looked forward to your posts everyday and truly have lived vicariously through your experience. Congratulations on a job well done and shared and thank you. The question will be, at some point in the future, would you do it again?! See you in Valdosta. We think this is a once in a lifetime trip, Judy. Once you ride from Van Horn to Marfa, TX, you question your sanity! What a fun day! Glad you got to go to Angel’s Diner. 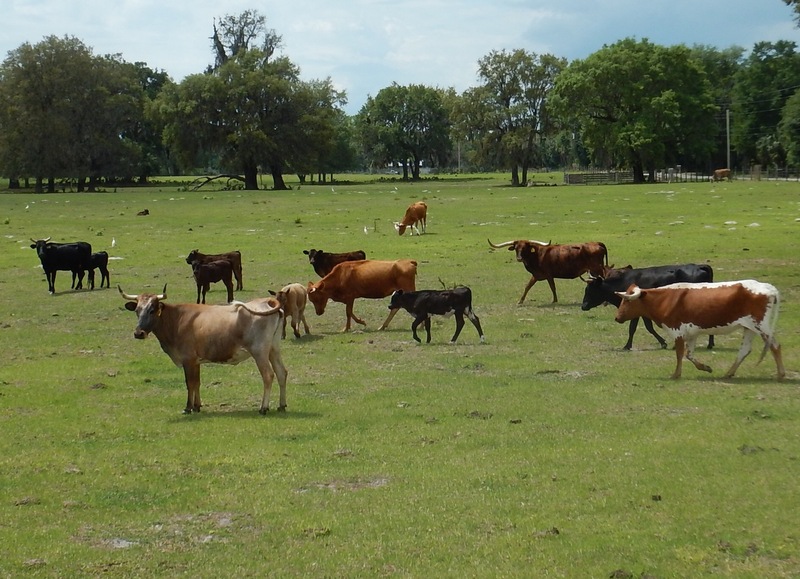 There aren’t many options in Palatka, but we love their burgers! Rest well and finish strong tomorrow. Florida “hills”. Hehehe. 35 miles left sounds so good. 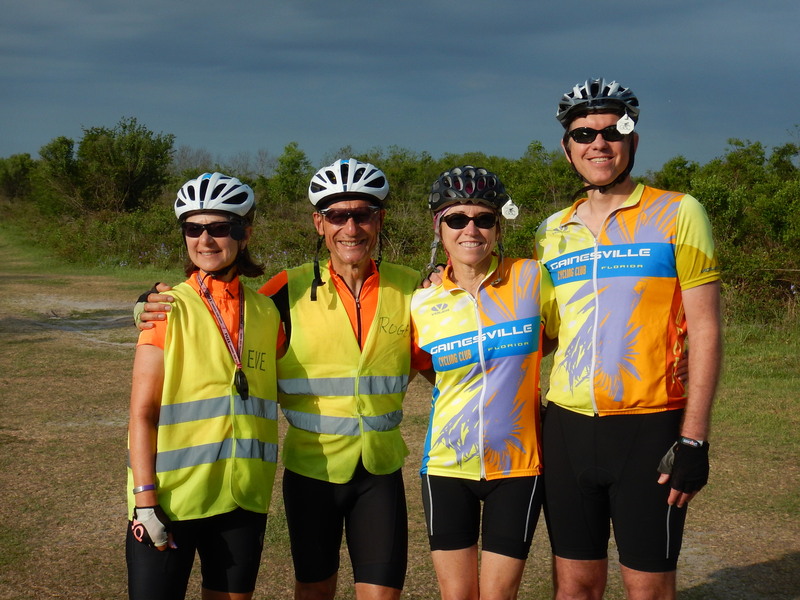 Those 80 milers were hard on my eyes….reading about them in your blog. Congratulations on a ride well rode! I am so impressed. See ya soon n Valdosta. Congrats Roger & Eve! We too have lived this adventure vicariously thru you. It was great to see you in Lockhart, TX. Mark’s knee surgery recovery is going amazingly well and we fully expect to be at GTR 2018! See you there! Amazing ride you two! Congrats on making the whole journey. I have enjoyed your blog every day. Well deservered rest coming soon. Enjoy the beach and yes… by all means, take some time off the bike! See y’all before too long. Great adventure and thanks for sharing all of your photos, reviews and anecdotes. Chuck Norris said “I’ve always found that anything worth achieving will always have obstacles in the way and you’ve got to have that drive and determination to overcome those obstacles on route to whatever it is that you want to accomplish.” I think you guys have demonstrated plenty of drive & determination to overcome the many obstacles you encountered (mountains, chip & seal, headwinds, crosswinds, etc.) so, when you dip your wheel in the Atlantic tomorrow, you will have achieved a worthy goal! 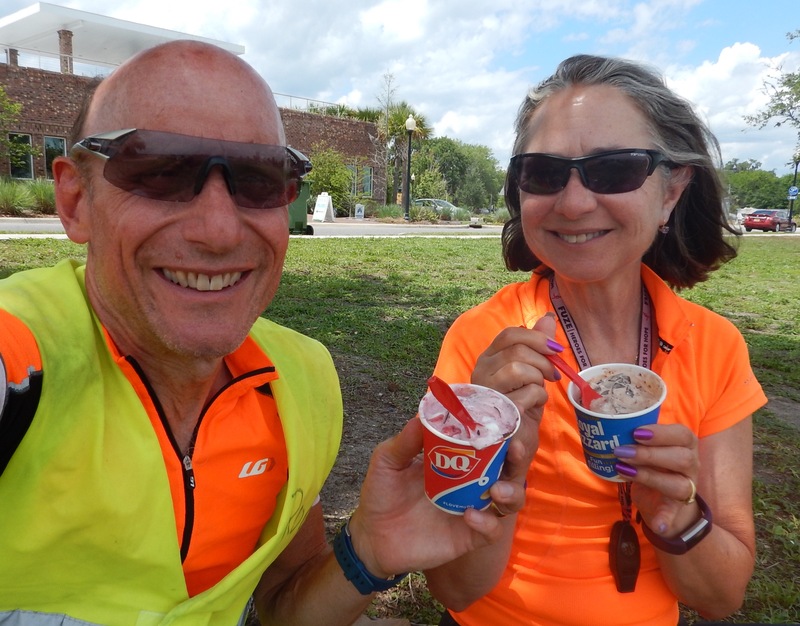 And, then, you need to find a DQ… quickly! Take Wednesday off the bike too. Heck, go crazy, take Thursday off also! I will miss your daily blog when your ride comes to an end! Again you both are amazing. Congratulations Eve and Roger a job well done. Your blog has been a welcome addition to the daily routine .. just enough to let us be on the road with you. In only a few hours the end will be here but the memories will live with you forever!! AWESOME as always! Thanks for the ride, see you in Valdosta. Oh! Just saw your dot for the last time. CONGRATS! You are there really smelling the ocean!! I love that your nails look as great on Day 52 as on Day 1. You rock! You are feet away from the end! What a wonderful feeling that must be. High as a kit on this windy day in Florida. Great job and congratulations! You DID IT!!! Thanks for the great blog and congratulations on your success. Great memories, for sure. Next Post Coast 2 Coast Day 52: Mission Accomplished!